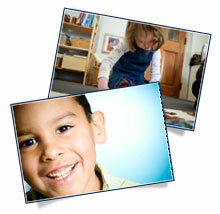 Montessori is a method of education developed by Dr. Maria Montessori in the early 1900’s. Montessori programs are found world-wide, spanning six continents and becoming extremely popular in the U.S. in the last 50 years. It is founded on the scientific observation of children’s learning processes; teaching abstract concepts in a concrete way through the five senses. The Montessori curriculum is organized into five main areas: practical life, sensorial, mathematics, language and cultural. The materials are available to children on low shelves with each subject area found in a different part of the room. Each work is designed to be used by hand and absorbed by the mind, providing a strong kinesthetic approach to learning from which all children benefit. Children are usually presented “lessons” individually or in small groups to maximize their learning potential and teach to each child’s readiness. An additional benefit is that this affords an opportunity for the teacher and child to cultivate a strong relationship. Dr. Montessori recognized that the only valid impulse to learning is the self-motivation of the child. Children move themselves toward learning. The teacher is the facilitator and resource person. She carefully observes the child’s behavior and growth, while often suggesting activities and materials that are appropriate for his/her development and interests. The teacher encourages active, self-directed learning and helps the child balance individual mastery with group participation, fostering social and language skills. Montessori teachers are always aware that they serve as role models, setting a positive tone for the work and interpersonal relationships.